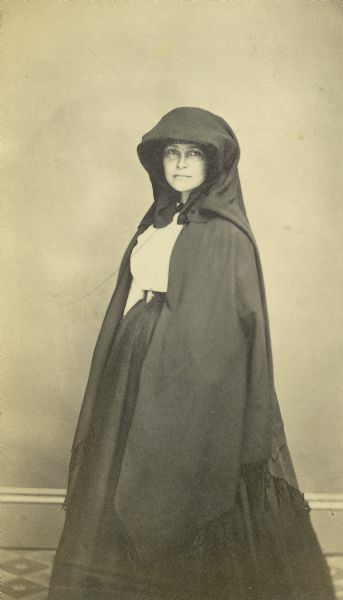 The Wisconsin woman most closely associated with the Civil War is undoubtedly Cordelia Harvey(1824-1895), sometimes called "Wisconsin's Florence Nightingale." She organized relief efforts, persuaded President Abraham Lincoln to open hospitals for soldiers in the North, and created an orphanage for the children of soldiers in Madison. But many other Wisconsin women contributed to the war effort. Alice Hurn, a University of Wisconsin undergraduate, researched this topic for her 1910 B.A. thesis, which was published the following year. Using information found in correspondence, reminiscences, pamphlets, newspapers, and interviews with survivors, she described a wide variety of women's activities. She devoted a chapter to women who went to the front as nurses, like Emily Quiner of Madison, and traced officers' wives and daughters who went to the South for months at a time. She even found at least two Wisconsin women who had donned uniforms and passed as men at the front. Hurn describes the work of thousands of women on the home front who rolled bandages, packed supplies, and raised money to support the troops. Separate chapters recount the histories of the Wisconsin Soldiers Orphans Home at Madison, the Christian Commission, the Northwestern Sanitary Commission, and the Milwaukee Soldiers Home. Read Hurn's book on Wisconsin's Civil War women. Read more about Wisconsin's role in the Civil War. View the virtual Wisconsin in the Civil War Collection.